Let me just start off rather bluntly…I was a mess when I married. I didn’t actually appear to be too much of a mess, although I’m positive there were signs; I actually pretty much fell apart once we were married. You know how adrenaline and optimism keeps you going…and then it doesn’t and you fall into a million little pieces “after the fact?” Well, that was my 1992-1997. 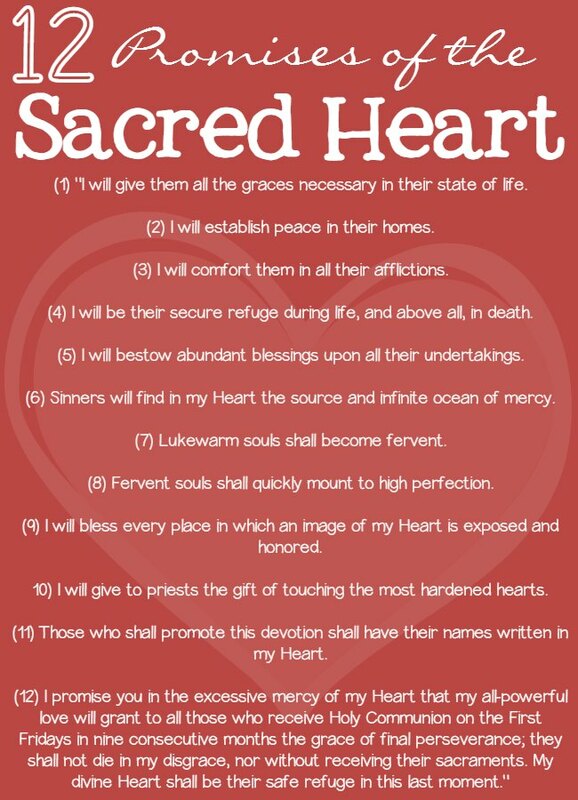 But somewhere along the way, sometime during 1996, I read a book on the Sacred Heart and started repeating daily affirmations based on the promises, before I even knew what daily affirmations were. I think back then I would have called these repetitions more of a battle cry than a daily affirmation; I was fighting for my life spiritually, physically, mentally and emotionally and repeating the promises of the Sacred Heart became my habitual battle cry, my daily affirmation, my anchor in a stormy mess of a poorly lived, miserable life. The opposite of the stormy mess I was living and pathetically calling my life, was peace. So I clung to the second promise of Jesus to those who were devoted to His Sacred Heart–“I will bring peace to their families.” I repeated this over and over as one does a daily affirmation, hoping just saying the words would change the course I was on; we all know that’s not how it works but man I hoped it would because I knew I was in for a long and hard battle. If the simple repetition of that promise wasn’t going to change things, wasn’t going to change me, then at the very least I needed a battle cry, a daily affirmation, in order to meet mess-of-a-self head on. And the third promise, “I will comfort them in all their afflictions,” became those quiet words of reassurance I whispered to myself curled up in the fetal position in the corner of my self destructive mind . “He will comfort me in all my afflictions,” was the healing balm to the wide open wounds baring myself left. I was raw and vulnerable and His promise covered me in grace and mercy. As necessary as I knew this tearing up–down–and apart was, it hurt like, well, hell. It hurt like a hell on earth. I told my spiritual father I honestly believed it would have been less painful were I to cut out my DNA and replace it with new. The beginning of this tearing down of Jenny in order to rebuild, because as the scriptures state, “you cannot put new wine into old wine skin,” was (providentially) founded on God’s love and mercy found in the Sacred Heart of Jesus. Could it have been founded on anything else? And been successful? Look around the world at all the hurting and you tell me.
. And I devoured that book like the starving soul I was. Funny because now when I pull it off the shelf to read it, it does not ignite that same spark of desperation or fervor it once did. Again, another “God thing” because years ago I would have told you that book was written especially for me with my name secretly embossed on every page. Are you in need of a good dose of mercy? Struggling under your own unforgiveness of self? Find your harshest critic, merciless judge and strongest enemy in the mirror? Grab this book and read…take these words of love and mercy in, devour them and be made new. And I hope I’ve shown how daily affirmations can in fact be very Christ centered. Were it not for Christ’s mercy and the daily affirmations I began using, I would still be in the mess I was. All for the glory of God right. His promises are so encouraging.